It’s not what you say. It’s how you say it. And there are five ways to do it. As I’ve written before, Albert Mehrabian discovered that when interactions contain more than just factual data, we attribute more of the message to body language and vocal tonality than we do to words (55% body language/facial expression; 38% tonality; 7% words). I believe that the Knower/Judger and Learner/Researcher don’t reside exclusively within spoken words but, in line with Albert Mehrabian’s work, can be found and experienced in the physicality and tonality of the delivery. Recently, I found a fantastic book that strengthens my theory and provides an entirely new way for you to approach your conversations. 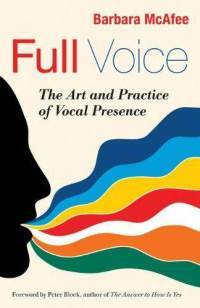 In Full Voices: The Art and Practice of Vocal Presence, Barbara McAfee identifies five voices we can develop, practice, and use to our advantage depending on the situation. The earth voice embodies gut instinct, authority, and grounding. It is used to project authority. When you need to confront a challenge or establish a firm boundary, the earth voice literally lends weight to your words. Too much earth voice and you sound like a bully. Too little and you sound ungrounded and uncertain. James Earl Jones, Sylvester Stallone, and Scarlett Johansson use a lot of earth voice. The fire voice symbolizes passion, personal power, and vitality. It is used when you want to convey conviction and dedication. An overabundance of the fire voice can intimidate, overwhelm, and irritate. Not enough and you risk being perceived as immature and incapable. Rev. Martin Luther King Jr., Janis Joplin, and James Brown all used the fire voice to their advantage. The water voice is caring, compassionate, and affirming. We use the water voice when we want to extend care and compassion, perhaps even sympathy. It’s pretty much the antithesis of the earth voice. Too much water voice in the wrong circumstances and one can be perceived as a lightweight “kumbaya” type. Too little (often supported by corporate environments) and we risk not being able to foster a caring culture among important people in our environment. Tony Bennett, Julia Child, and Nat King Cole are examples of people with water voices that define their public personae. The metal voice is the transmitter of clarity and focus. It has a sharp edge that cuts through background noise and is used to amplify without causing strain. The metal voice is not one you would use in a one-on-one conversation where it could be misconstrued as overuse of the earth voice, but it works well when you need to be heard above the din in a crowded room or at a sporting event. The air voice is the transmitter of inspiration, possibility, and spiritual connection. It’s the voice we can use when we don’t want to engage in all that ritualistic unconsciousness. Using a hushed voice with dramatically timed pauses can bring listeners out of their seats. Overuse, however, can cause you to lose your listener… put them to sleep. The air voice has most value within a presentation to help the listener understand it’s his job to be inspired at this point. Air voice examples include Art Garfunkel, Marilyn Monroe, and Enya. Where can we find the K/J and L/R in these voices? A significant amount of earth voice without any component of water voice can certainly be heard as K/J, no matter what the words actually are. The air voice almost by definition is a L/R transmitter… again, regardless of the words. How we say the words, no matter how innocuous those words are, greatly affects our ability to connect. You can tell a puppy that you love it in a metal voice, and he’ll go hide under the sofa. Think about this when you’re incredibly upset and picking your words carefully as you explain to your teenager why you don’t want her to go out with the boy from the ’hood. Or when correcting a direct report for some infraction of company policy. Or when dealing publicly with some unmet expectation. I love this book. I urge everyone to find a copy. Now to find the source for body language and facial expression.